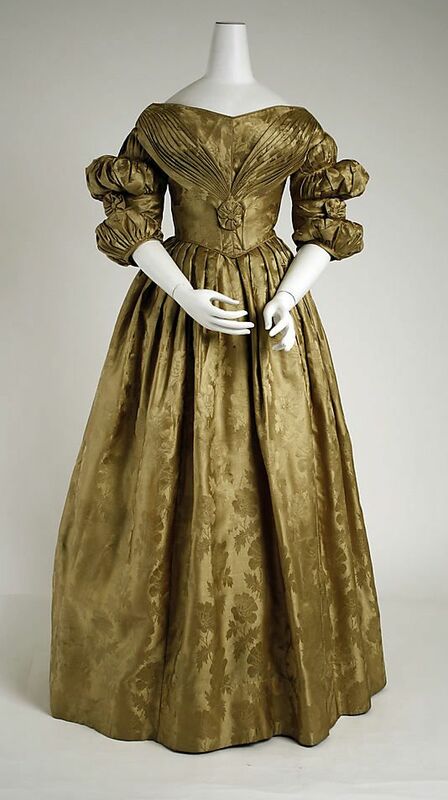 As mentioned in my 1830’s dress post, I wore it to the new-year’s ball in Ghent. The theme was 1830-1860 this year, and it was the perfect excuse to finally make this dress. The ball is held in the opera of Ghent, in a beautiful baroque style room. This year, there was a dance workshop in the afternoon, which we went to as well. After the workshop, it was time to eat, and then prep for the evening! I started on my hair, as I’d never done 1830’s hair before. I tried to photograph the process, maybe it’s helpful! As I don’t have any hair shorter than hip length, I used fake hair for the side curls. This is such a typical thing for the era, I didn’t want to do without. These are real-hair extensions which I modified, and I’d curled them with rollers (wet-set) before. My other piece of fake hair was a very long weft. I used this to supplement the braid. Although my hair is very long, it’s not very thick, so I can usually use a little extra volume. Firs step was making the typical v-shaped parting. I then put everything up in a very high ponytail. The front done, I pinned the weft into my ponytail and braided the whole lot. I then wrapped it into a bun, taking care to wrap the second time on top of the existing braid to create height. I then hid the ends and elastic inside the bun. And done! To finish it, I clipped in two huge flowers to the side of the bun. For another tutorial (including the famous loops), my friend Nikki has a wonderful tutorial on her youtube channel here. The ball itself was really nice. There was a lot of dancing, and swooping crinolines. I quite liked my corded petticoat, it was definitely easier to dance in than a hoop! In-between dancing there was social time with friends, taking pictures, and just looking at all the other lovely people. Some pictures! We did a 1830’s group picture at the end. It took a while to get us in order, but eventually we managed to behave. I started thinking about a 1830s dress quite a while back, mostly inspired by the wonderful Nikki, who does this era so well. About half a year ago, the theme for the new-years ball in Ghent was announced to be 1830-1860, and I figured that this would be the perfect excuse to finally start this dress. I love the sleeves on this dress, how they still have the fabric fullness, but also the pleats. I also quite liked the shape of the bertha, and the little rosettes. Extra bonus was that I figured I could make the ‘sleeve bands’ removable, and make the dress more versatile this way. It also has removable undersleeves, and a pelerine which transforms it into a day dress. I’m all for versatility, so that’s great. In making this dress, I tried to copy it as much as possible. That meant lots of piping, and double piping, which was quite a bit of work, but definitely worth it. The process of making double piping I found in the 1876 ‘Guide to dressmaking ‘, which can be found online (page 30). Basically, you take a bias strip, put a cord in one half, then a cord in the other half, then fold double to get a double cord. The bertha was made following Janet Arnold’s ca. 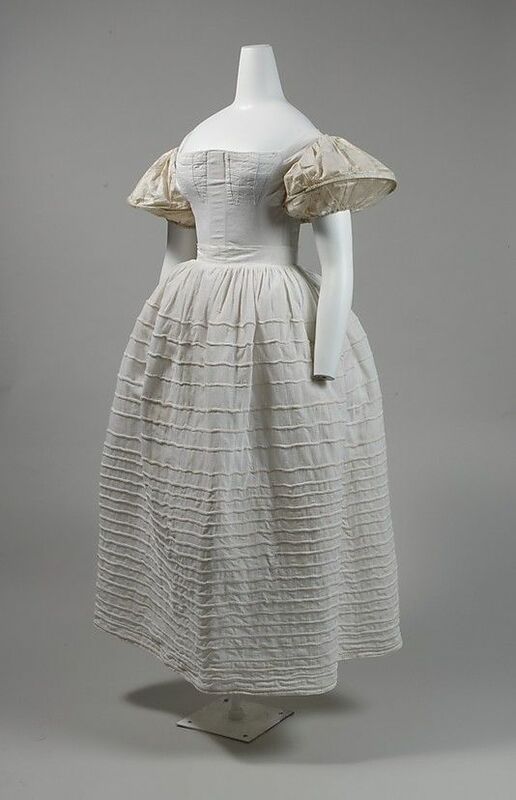 1840 dress. It has a cotton canvas base, and the silk are bias strips which are stitched on top. It looks like pleats when finished, but the construction is quite different. For this dress, I also really wanted to try out padding, inspired by a talk by Luca Costigliolio on padding in 19th century bodices. (The gist: it’s extremely common, for all types of figures, through the eras. Sometimes visible, sometimes hidden.). The silhouette in this era is quite wide, and I can use a little help in the bust era in general. I made my padding of cotton quilting sheets. Cutting in layers of 2, I cut 4 circles in increasing diameter. I ended up taking off the smallest one, and folding it up to fill in the space above the bust a bit. This is a place you often see padding in originals as well. The padding was placed quite wide in the end, as the main goal was to increase width. I really love how it ended up, the effect is subtle enough that you don’t immediately think it’s padded, but it helps the whole shape so much. I sewed a cotton ‘lining’ to the padding before sewing the whole thing into the bodice. This is the final shape. The sleeves are pleated towards the middle at the top, and then stitched a bit further down as well. The armhole is piped, and the shoulder seam as well. For the final sleeves, I made sleeve bands which are pinned around the fullest part of the sleeve. I also followed Janet Arnold for the skirt, taking inspiration for the skirt fullness, and gathering the very back, then pleating the rest forwards, as the original also shows. I choose not to fully line the skirt, as my original shows a line of stitching where the facing is attached, so I faced the hem as well. Hem facing. The long stitches are to catch the silk where it’s folded double, so the hem is basically 2 layers of silk and one of cotton. I sewed all invisible seams by machine for this dress, but all the finishing is by hand, as usual. The dress closes with hooks in the back, and the final touch are the little rosettes. One to hide the endpoints of the bertha, one on each sleeve band and one in the back. They are made by covering a button, and then gathering a folded strip of bias to form a circle. I managed to finish the whole dress just in time for the new years ball last weekend. I’d counted on skipping the sleeve band, or not finishing the insides, due to lack of time, but it was done! I made this in about 5 weeks, (2 of which were holiday), which I think is a record for me. I also managed to finish without rushing through anything, which I’m really pleased with. Now I just have to make under sleeves and a pelerine with a whole number of small petals…. So, some finished pictures of the dress on me! More on the ball itself in a next post! When I started my 1830s project (which up to now just consisted of a petticoat), I knew I also wanted a new corset. 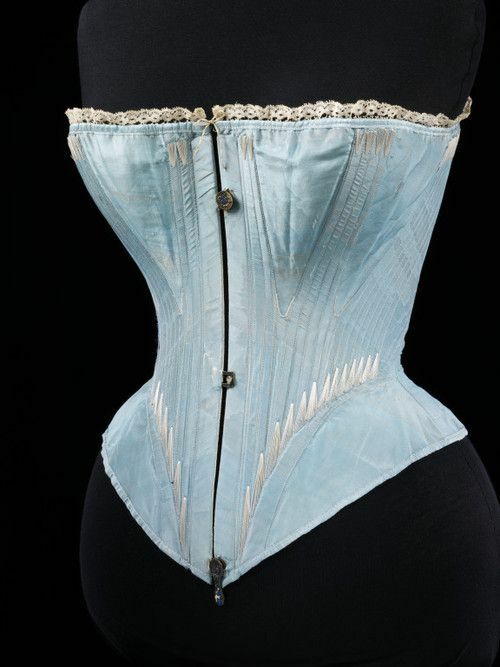 I’ve got a somewhat slimmer corset which I’ve used for my 1870’s dress, and a curvier one for the 1880s. 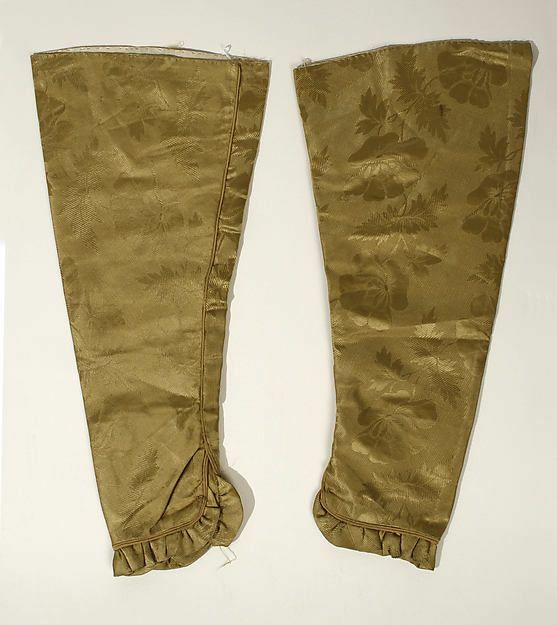 And I’ve got a pair of regency short stays, which actually act more like stays in that they ‘lift’ more than ‘separate’. 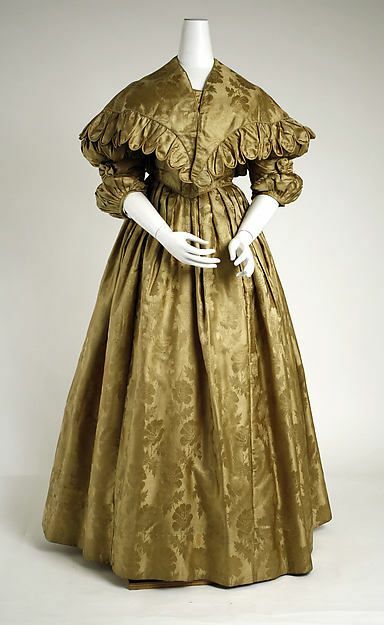 For the 1830’s, the goal is a high, still slightly separated bust, though not as high as regency. 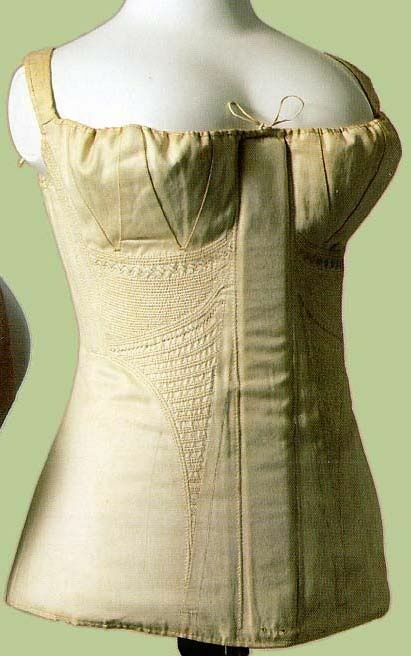 Most ‘typical’ 1830’s corsets are transitional, meaning that they are somewhere between the soft, cupped, corded regency stays, and the more waist-defining corsets of the 1840’s. This was a very transitional period, so you get a lot of different styles which are a bit difficult to date. Many original pieces are dated something like ‘1815-1840’, so quite a long range. In the end, I decided to base my corset on the ca. 1840 example from the MET shown above. I did not want straps, as they can show underneath a dress. 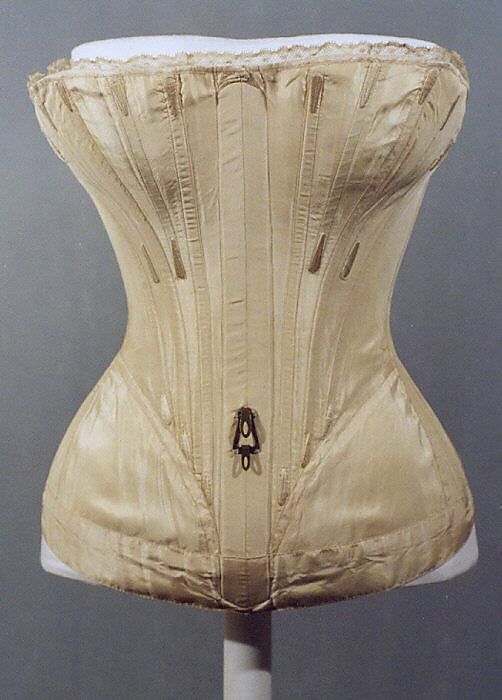 And I wanted to, ideally, be able to wear this corset for 1840’s, and possibly 1850’s stuff as well. The main difference is the waist definition which gets more pronounced, but a more pronounced waist is not a problem for an 1830s dress. The only other thing which slightly changes is that the bust drops a little, but given my shape that would not really be noticeable. I also wanted a defined hip-spring, as I need a large difference between waist and hips naturally, so the more ‘straight’ shapes wouldn’t work very well on me in any case. I chose to make one more concession to accuracy for practicality reasons. 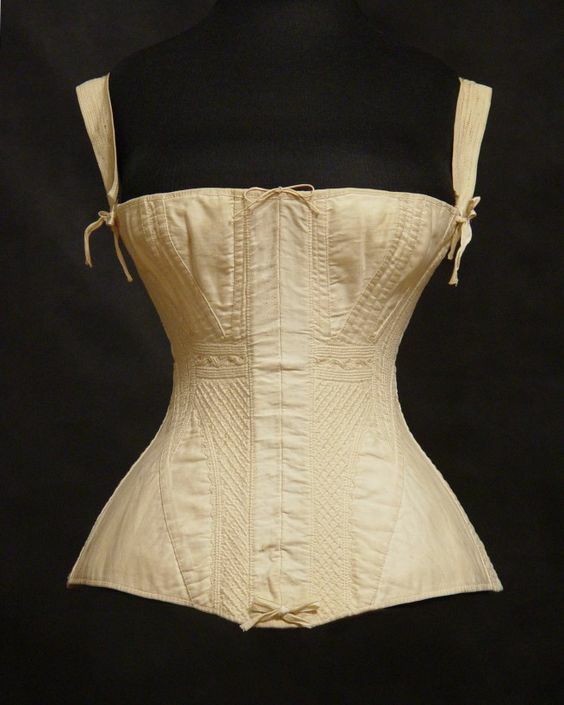 In the late 1830’s, all corsets had a wooden busk, and spiral lacing. The split busk was invented in the 1850’s, and with it came the ‘typical’ straight lacing you see on corsets to today. The split busk makes it a lot easier and quicker to get into a corset by yourself, so I decided to add one. Technically, this makes my corset more like the 1850’s and early 1860’s styles, which are actually cut very similarly, but with a split busk. The 1840 one from the MET does not have bust gores, which is actually quite unusual for the time, I think. However, I definitely don’t need them (they’re mostly handy for larger busts), so that was not an issue. And I really like the ‘hip’ panel, as that gives a lot of room for a large hip spring. A final advantage was that this piece was photographed really well, so I could actually see where the seams were, and figure out what the panels should sort of look like. I ended up drawing the pattern from what I saw shape wise, and then made a number of mock-ups to actually make it work for my body. It took some trial and error, and no very systematic process was followed, but I ended up with something workable. For construction, I used two layers, one cotton canvas and one plain cotton. I first inserted the busk, and then attached both lining and canvas layer of the second piece to the first, at the same time. By laying the canvas layer on the canvas layer (right sides together), and the lining to the lining (right sides together), and then stitching the seam in one go, you get the seams ‘within’ the corset. This gives a clean finish, and provides extra layers as strength for the boning. I think this was also the way the original was finished, as it shows the same clean interior, and the top-stitching, although I cannot be sure from pictures alone. In any case, it worked! I opted to cut the hip panel on the bias, to give some flexibility there, and just to experiment. I tried to see the grain on the original, but the weave of the fabric makes it impossible to see despite the high resolution. It does pull a bit, creating a bit of a wrinkle, so I’m not fully sold on this method yet, but otherwise it works. It’s very curvy when just taking it off the body! I did not really take many construction pictures, as the corset was made during quite a busy time, with low light in the evenings, but I’m actually quite happy with how long it took me to make. It’s boned on the seams with synthetic whalebone, plus two bones in the side/hip panel all the way down, and extra bones in the back, as in the original. I’ve got one steel bone to support the eyelets center back. It’s quite curvy, which is something I’m really happy about. I feel like this might be the first corset I made where I didn’t have too little room in the hips/bust in the end. I tend to underestimate the hip spring I need because I need to always increase this, and I tend to overestimate how much I need to take in the bust. But a corset works best if it actually leaves room at the top and bottom, and only reduces in the waist. This corset actually does that, which is nice! It’s not the prettiest thing I’ve ever made, being of quite utilitarian fabric, but it works, and the shape is good. I might floss it at some point in the future, but for now, it’s time to start looking towards actually making a dress to go on top! (Which, if you’ve been following my instagram, you’ve already seen some peaks of. It’s looking good so far! Some pictures of the corset on me! I’ve mentioned a couple of times that my next big project will be a late 1830’s dress. As this is a completely new period for me, that meant new underwear! 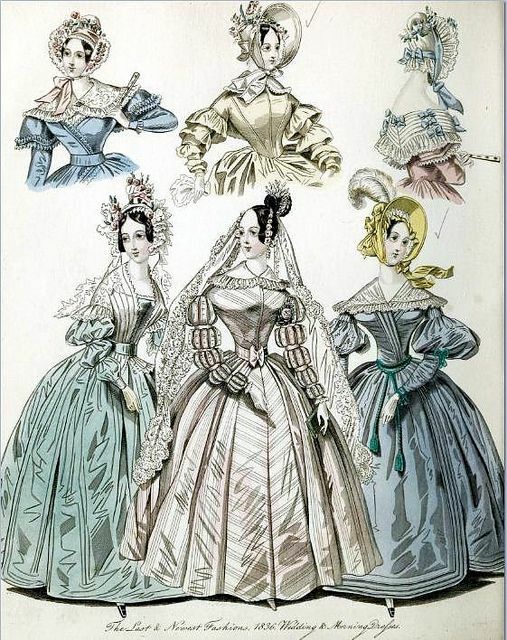 The 1830’s see the rise of the big round skirt. It’s before cage crinolines were invented, though, and so the silhouette was achieved through many layers of petticoats instead. This was made a little easier through structuring the petticoats, making them stand out. Most noticeably, through running cords through petticoats. The cords stop the fabric from folding up, and so the skirts stand out more. Add starch, and a couple of extra layers on top, and you get a pretty big skirt! For my corded petticoat, I roughly followed the guidelines in Izabella Pritcher’s book the Victorian dressmaker. I found fabric which was 3.2m wide, and decided to just use the full width. This makes my skirt on the wide side, but I figured I might be able to wear it with 1840s as well this way (as the skirts keep growing!). I cut the whole skirt in a double layer, so it’s two layers of fabric. The cords are then stitched between these. I started with 5 rows, and then did another 5 rows. Above that, I switched to 3 layers, all the way up to my full hip. There’s no ‘rules’ for how to cord your petticoat, although more on the bottom than at the top, and stop at hip-level seems to hold for most existent petticoats I’ve seen. I’ve heard a lot of horror stories about cording, but I actually quite liked the process of making this. I just did a couple of rows in the evening, not trying to finish it all in one go. It helps that cording is about the most mindless activity in sewing you can think of, and after a full work day of focusing that was actually pretty nice. I hope to make at least 2 more petticoats to go on top of this one. Maybe one other with just a couple of cords at the bottom, and pin tucks. And at least one ‘prettier’ one with tucks and lace to go on top. First up for this project is a new corset though, stay tuned for that!